With the Paris UN Climate Change Conference in the rearview mirror, the path to reducing carbon emissions is a lot clearer. At that meeting, the world’s nations agreed to limit global warming to below 2°C, with 185 countries making tangible plans to achieve this. Thousands of businesses have also made pledges to aggressively decarbonize their operations and supply chains. What will they gain? A way to disrupt their markets with business models that rewrite the rules of competition. Innovative business models that – with a digital foundation – create new ways of operating that were inconceivable even a few years back. Consider areas like mobility and logistics, manufacturing, agriculture and energy. 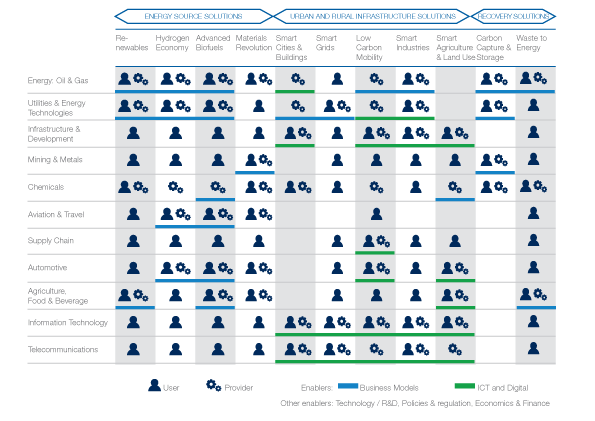 Digital drives down carbon and enhances competitive positioning across all these areas. In mobility and logistics, it does so through things like real-time traffic management. In manufacturing, it does so through customer-centric production and circular supply chains. Smart agriculture drives water and energy efficiencies to boost crop yields, reduce food waste and ease access to markets. In the electricity sector, digital platforms help integrate renewables like solar and wind onto the grid, improving the efficiency and dynamics of the energy grids and enabling customers to make considerable savings. Digital transformation of industries will be worth over $100 trillion by 2025 . 1. Harness the end-to-end value chain. That begins by identifying common opportunities with other players in the value chain that will increase the scale of the action taken, and, in turn, the economic and environmental impact. Initiatives that cannot be achieved solely by an individual company can become very attractive when delivered in partnership. 2. Go beyond “the usual suspects” in your ecosystem to find the right partners. Finding the right partners to involve in the value chain means looking beyond the “usual suspects”. The challenge is to find the ideas best suited to address the specific value chain challenge, and create partnerships with the organizations that are best able to realize those ideas. Building successful partnerships requires a good understanding of the sources of value (social, economic and environmental) for all stakeholders and sharing them equitably and proportionately to the effort expected from a given partner. 3. Leverage resources and define roles to build a scalable initiative. Scaling up any initiative requires commitment and investment (both time and resources) from all partners, and the careful monitoring of performance so that plans can be refined quickly to address issues. Roles and priorities need to be clearly defined. That way they’ll be used as efficiently as possible to achieve the maximum impact. 4. Embrace digital . Open access, digitally-connected value chain collaboration platforms provide a straightforward way of collecting and sharing important information among players along value chains. Connecting this way reduces the effort and transaction costs involved in scoping and implementing collaboration. Depending on the nature of the initiative, such as the problem to solve, what is needed, and the barriers to be addressed collaboratively, the platform can play different roles. For instance, it can serve as an online information and partner hub, providing a searchable database of key contextual information, like legislative information, value chain maps and case studies to inspire and support organizations planning new initiatives. It can also make it possible for organizations to search for partners to join their initiative according to variables like an organization’s capabilities and geographical location. Furthermore, digital industry platforms are recognized as an effective way of broadening an ecosystem of collaborators to drive open innovation. As an added bonus, the platform reduces the cost associated with finding the right partners to collaborate with and it creates a quick, low-cost way of sharing data on value chain activities, issues and opportunities. 5. Unlocking hidden value . As the world embarks on a low-carbon transition, leading companies are looking towards new business models, including circular economy approaches that have collaboration and innovation at their core. Digital technology underpins these efforts. Those that successfully collaborate have the opportunity to unlock hidden value in their operations as they move towards becoming industry leaders in a low-carbon economy.